Capilano College Performing Arts recent production of Steve Gooch’s play Female Transport was an interesting choice. I especially liked director’s Bill Murdoch’s description of finding the play on a dusty shelf tucked away in a used bookstore on Pender Island. Steve Gooch is an English playwright. He’s been fairly prolific over the years and it appears from this description here on this website that his works are informed by the class struggle and Socialism and I quote. Given this background this play was a most intriguing choice for a group of young theatre students in North Vancouver to tackle and they acquitted themselves well. 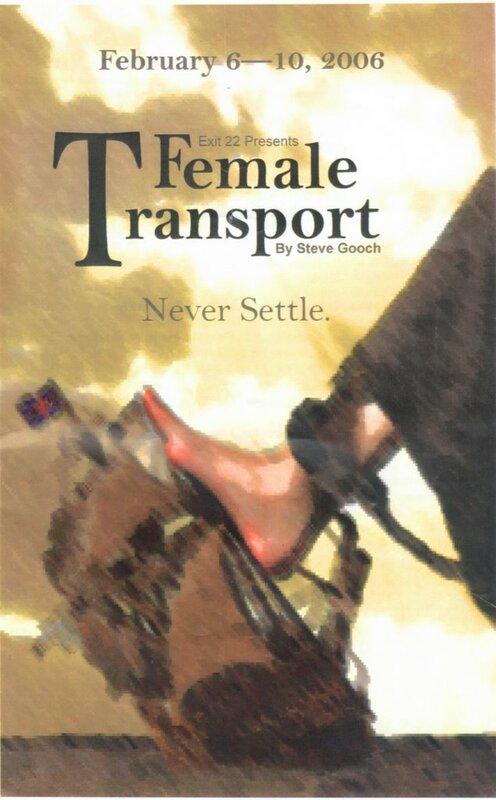 The play’s subject matter tackles the transport of women petty criminals to the penal colony of Sydney Australia. The women are all strong individualists forced by circumstances to confront their dire situation and in so doing slowly come to a realization that they are more likely to survive the trip and penal colony if they face their deprivations collectively. So it’s here that the crux perhaps of Steve Gooch’s emphasis of collective action against a male patriarchal hierarchy is given a voice. I found the individual personalities to be somewhat clichéd caricatures. Contrary to this quote on the website “Gooch chips out highly convincing people, not the caricatures which sometimes pass for realism in radical theatre.” While there’s definitely a utilitarian aspect to putting on this play to provide arts theatre students the opportunity to perform in a diverse ensemble cast however I found Gooch’s characters and motivations a little hard to believe. The prime example I can allude to is the ships doctor. When we first meet him he’s a principled medical doctor insisting that the convicts be supplied with fresh food, plenty of exercise etc for the long voyage. When we leave him at the end of the play he’s drinking with the captain having come to an agreement for 20% of the profits from clothing manufactured by the convicts during the voyage. He has come to this arrangement according to Gooch by threatening to provide a report to the Sydney Authorities regarding the captain’s treatment of the convicts and his own need to secure a passage back to England. So the captain and doctor strike a deal to profit from the workers labour. Surely an educated man signing on for a voyage to Australia would have some idea of the need to return at some stage. Nowhere does Gooch provide any logical motivation for the doctor to morph from highly principled to entirely self-serving. I can only presume that in Gooch’s worldview the medical profession at least at that time in England’s history was bound to throw it’s lot in with the bourgeoisie no matter it’s professed duty to the sick and dying. I found it ultimately unsatisfying from a characterization viewpoint ironic since the play utilizes a fairly large ensemble cast but satisfactory I suppose when looked at from a Capitalist/Socialist perspective. Congratulations to the Director and cast for attempting something different and kudos to the set designer who I thought did a fine job.